Excuse me for the discourteous tone of previous message; it was sent prematurely. 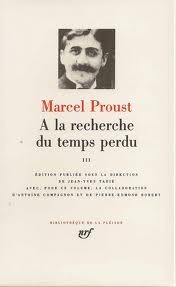 You should find Proust's text on line. If you contact Hourschool you will find the help you need. I belong to a generation of people who have not accepted communication with or through electronic means. I do teach Proust, but the whole system of Hourschool remains a mystery t me. With my apologies. Cordially. Marcel Muller. Carole, If you go to the course page, you will see exactly two book indications. One is for a book that Marcel, our professor, uses. The other one has the on line reference with the pages to read for each posted class. It has a link and you just need to click on it. Then, you can read. If you do not manage to finish the reading for the class, you will still enjoy all the aspects of the novel that Marcel highlights and you can use what he teaches as a guideline for catching up. It works both ways. Thank you for asking. I hope you can come.